Kalmbach publishers have had several new books recently that have been designed either for beginners or for people with limited time, and they have all been GOOD! This latest one is no exception: 18 Beaded Jewelry Projects You Can Make in a Weekend, by Dorothy Wood. Although this volume is not specifically full of beginner projects, it will still be appreciated by those just starting out. The projects are fun, pretty, and modern, utilizing many basic skills. All of those skills are discussed and explained, with the excellent photos that Kalmbach is known for. The main point of Dorothy's book is that the projects are fast! But they are not dumbed down or sloppy: there is a great emphasis on doing things properly, with good technique, with an aim towards making lovely things that you will definitely want to wear. 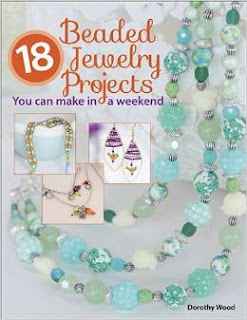 tHIS BOOK WOULD BE AN INSPIRATION FOR ME BECAUSE i AM NEW TO JEWELRY BEADING..i LOVE BEADING. THIS WOULD BE A BLESSING FOE ME TO WIN THIS BOOK as I can not afford to buy it. thank you for the chance to win it.! This book would be a great one to have for inspiration and the fact that the projects don't take too much time. I would really love to have it.